Summary: What if you could save valuable time, money and effort all while enjoying better meals with the whole family? Make-Ahead Meals for Busy Moms shows you how with a whopping 140 delicious feasts that are so easy, you'll never opt for take-out again! The secret lies in Jane Doiron's recipes optimized for make-ahead preparation. You'll get special menus perfect for freezing, pre-assembling or quick reheating -- so that you can plan your family's dinners when you're ready, not when you feel pressured and stressed out. As many of you already know, I am a huge cookbook fan. I don't cook a lot (and I really don't even like cooking all that much), but I love looking through cookbooks! I know it sounds kind of weird, but I blame my grandmother who loves to do the same thing. Of course, she had six kids and cooked three meals a day for 60+ years! When Jane Doiron, author of MAKE-AHEAD MEALS FOR BUSY MOMS, contacted me and asked me to take a look at her cookbook, how would I say no? Overall, I was very impressed with Ms. Doiron's cookbook. I found her instructions to be very thorough as well as very easy to follow -- a must for me with cookbooks! I especially liked how she had separate instructions for how to prepare the recipes ahead of time, and I loved all her advice about freezing. I can see how this cookbook could really benefit busy women; and I think the advice for advance preparation could come in handy for entertaining and dinner parties. My only real criticism (and it's a personal one) is that there weren't pictures in the cookbook. I absolutely love seeing the finished products, but I realize how expensive it is to make a cookbook with photos for every recipe. So many of the recipes do sound delicious, but I have to warn you that this cookbook isn't necessarily a low-fat or healthy one! There is actually no nutritional information in this cookbook; and there are a lot of recipes that include mayo, cheese and heavy cream. I have no idea if these recipes can be lightened up with lower-fat ingredients, but I'm curious to try a few with the substituted ingredients. Normally I try to cook fairly healthy for my family, but I don't mind splurging once in awhile for a really good meal or when I entertain. I can definitely see using the cookbook for these occasions. I have held off on writing this review because I wanted to actually make one of the recipes in the cookbook. While I was drawn to many of the brunch and dessert recipes, I thought I'd try something that our entire family can eat. That's never an easy feat for me given my son's food allergies, but I did find a recipe for Teriyaki Chicken that worked. Since I'm a bit under the weather, my husband actually did the prep and cooking for this meal; but I thought it looked pretty quick and easy! While it did have 10 ingredients, they were all items that we keep on hand. We ended up substituting the boneless chicken thighs with boneless chicken breasts; and it was a big hit! My kids (and especially my son) loved the meal. While we didn't take advantage of the make-ahead instructions for this recipe, I found in interesting that you can make the marinade with the chicken and freeze for up to three months! 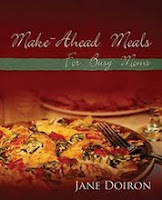 There are tons of great recipes in this cookbook -- I think there are 140 -- so it's definitely worth the $17.95 price tag. Take a look at the Table of Contents to get a better idea of the variety of recipes available in this book. There is a huge range of recipes from quick, healthy main dishes, to meals perfect for entertaining, to delicious brunch ideas, to yummy desserts! I had no problem finding recipes that my family would enjoy, and I actually was marking a lot of pages for future reference. Jane Doiron is a busy mom herself! She has spent years experimenting in make-ahead recipes, and this cookbook shows her expertise. Ms. Doiron maintains a blog where she provides more recipes and tips, and she also had a Make-Ahead Meals newsletter that you can sign up to receive. Thanks to the author for sending me a copy of her cookbook! I'm a bit of a cookbook fanatic myself. Sounds like one worth checking out! We are a lot alike! I love cookbooks, too, but I'm not crazy about cooking. I only do it because I need to eat. I do like pictures in my cookbooks, too. I like pictures too, or even drawings, so you at least get an idea of what you're striving to reproduce. But still, the idea of a make-ahead cookbook is appealing, even without pictures! I like pictures too but if it has easy instructions I'd probably use it more often. I really need this or something like it. I used to do Dream Dinners which was great, but the one near us closed. Plus is probably cheaper and definitely more flexible. This sounds fantastic!! I love cookbooks and love to cook, but like most working mothers I find it hard to always get a hot, fresh, homemade meal on the table every night. I am going to look into this one! Sounds like a great cook book, but I do love the pictures. That's how I "read" cookbooks. I love cooking and cookbooks. This one sounds good with the make-ahead ideas. I think I'd miss pictures, though. I reviewed this one too. And, I had the same issue: I really wanted pictures!! I think it would be a great cookbook for people looking for some good, go-to recipes.